The crowds at Angkor Wat, near Siem Reap in Cambodia. Despite the early wake up (before 5am!) 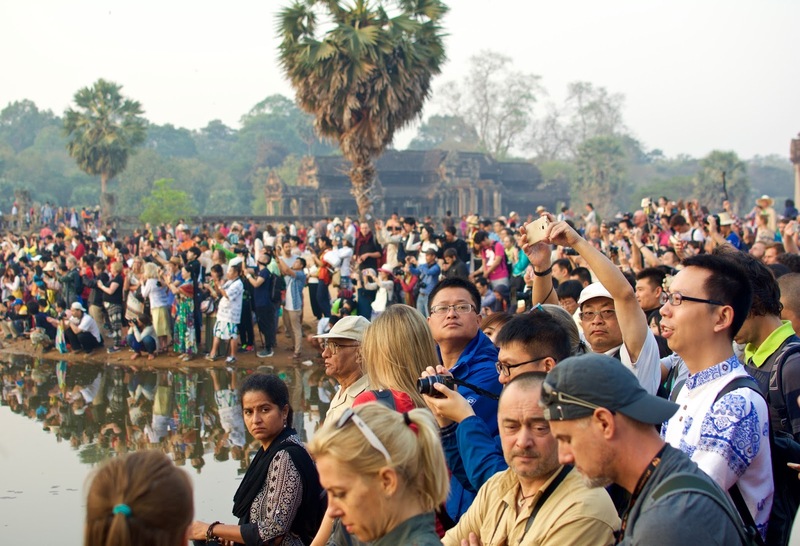 to catch the sunrise over Angkor Wat, the amount of people were insane! Cambodia is an amazing country that I would recommend you go to, but perhaps not for the reasons you may think. I'm currently transversing through the country, and seeing and learning things I never thought I would witness. Besides the sheer number of tourists filling every city (it's actually crazy! Sometimes I feel like I'm back at home), Cambodia as a country is quite radically different to anything I'd seen before. The locals are incredibly different in their nature of living and personality; it contrasts very significantly to the lives of foreigners here. It's curious to see a country so highly influenced and swayed by the tourism industry; USD is highly accepted, almost everyone speaks some English, and a large majority of stores, stalls, and restaurants are catered specifically to Western tourists. Learning about the history of Cambodia has also been a breathtaking experience. If any of you don't know anything about the S-21 Concentration Camp and the Killing Fields in Phnom Penh, I highly recommend you read up on it; they are some of the most harrowing stories I have ever read. The food here has been rather ordinary, if I must comment on it, and shopping is alright -- the thing that I've appreciated most about Cambodia is learning about the Khmer Culture and its People, which I must say is rather quite unique and worth getting to know.